Farmers Market Garden Vegetable Quesadillas. 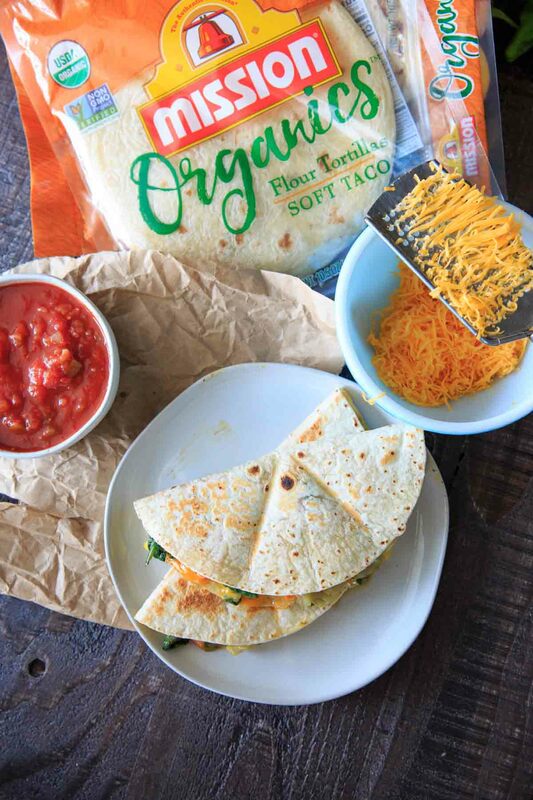 With squash, peppers, spinach, freshly grated cheese and Mission Organics® Flour Tortillas, these are easy to make and customizable with your choice of fresh organic produce available at your local market. Let’s talk farmers markets – do you live close to one? Do you go often? I’m lucky to be in an area with many choices. The Raleigh State Farmers Market is open all week and is fairly massive and the downtown Durham one, while only open on Saturday mornings, also includes crafts and local food trucks. There are also many smaller ones spread out throughout the Triangle area filled with local vendors. When Mission reached out to me to create a farmers market recipe with their tortillas, I had a tough decision on which one to visit! I just love the Durham Farmers Market unique vibe. 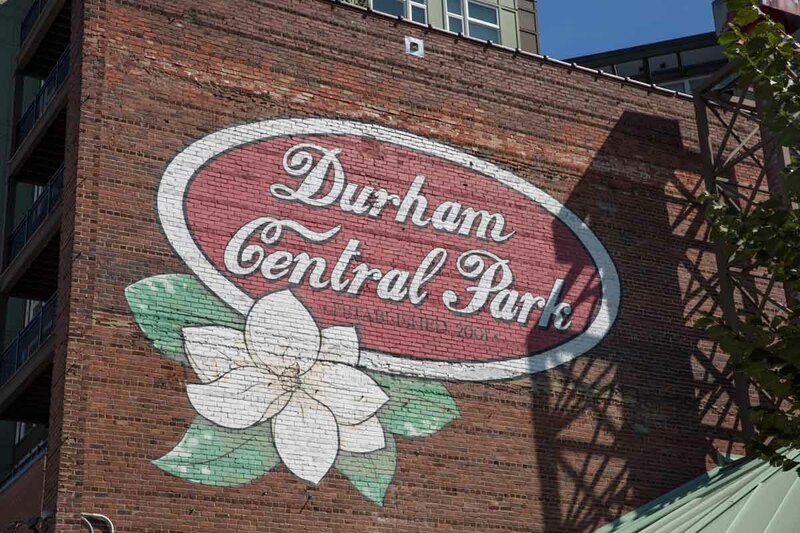 It’s located in Durham Central Park downtown and is transformed every Saturday morning. They are a medium-sized market where you can peruse their fresh produce, baked goods from local bakeries, handmade crafts, as well as food trucks and brewery stands. It has the perfect mix of variety, location and also a little more breathing room (after the 8am crowd leaves). September is Organic Harvest Month, which is a time to celebrate the many benefits that organic produce and agriculture offer. Organic produce simply means it is grown without pesticides, synthetic fertilizers, or GMOs. Because there are no preservatives, it is also considered fresher. I try to buy organic whenever possible, and I’m lucky that my farmers market has organic produce available. From tomatoes to squash, to peppers and greens – I have many options. It is also why I’m so happy to have an organic tortilla option from Mission Organics that not only tastes great is also sturdy enough to hold these veggies! Mission Organics tortillas are USDA organic certified, non-GMO project verified, and contain no artificial preservatives, colors or flavors. Since they are made from simple and wholesome ingredients, I wanted to make sure I filled them with simple and wholesome vegetables! When I arrived at the market, I wasn’t entirely sure what I wanted to put in my quesadillas. I decided to make a couple laps around first and see what fresh organic produce stood out to me most (and ask a couple questions along the way). Squash was one vegetable that was everywhere – both summer and winter varieties. Yellow squash was calling my name as I know it is quick to cook and also edible raw, and has a fairly mild flavor that mixes with other ingredients well. North Carolina often stays fairly warm even into the fall, so while yellow squash is usually referred to as summer squash, it is plentiful well into autumn here. He gave me a little overview of each kind, and since I was still unable to make a decision on just one – I bought three. Aji Dulce, Padron, and Zavory. Aji Dulce and Zavory peppers are both similar to habanero peppers but without the intensity. My guy described Aji Dulce as having a sense of “heat” but not “fire,” and the Zavory as being very mild. Padron peppers are excellent when grilled with a little salt, and 1 in 10 are likely to be spicy. This variety sounded like they would go well with the squash and adds a nice sense of color as well as a slight variety of heat. And they all looked so delicious, I couldn’t choose just one! I also saw the cutest little mini bell peppers! Bell peppers that are not green (orange, yellow or red) have ripened longer and are generally a bit sweeter. These are my favorite kind, so I grabbed a container. To balance it all out, I also grabbed some organic spinach. What’s great about these quesadillas is you can use whatever fresh organic produce is currently available at your farmers market. Butternut squash would also work great with these tortillas, though since it is a harder squash, it does take a little longer to cook (and I like to roast it). Other fall vegetables you could use in your quesadilla include okra, mushrooms, cauliflower, or eggplant! Since the vegetables I chose can be eaten raw or lightly cooked, I decided to lightly sauté them with some onion and garlic. 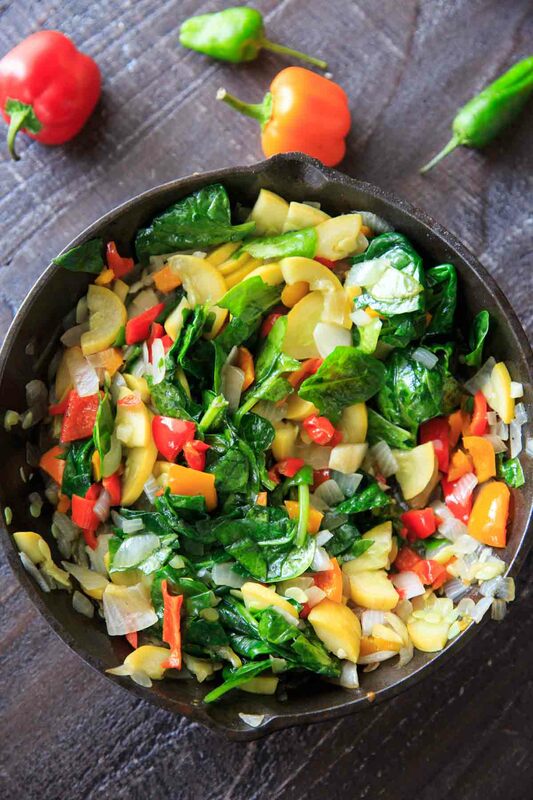 I stirred the spinach into the peppers and squash after cooking and it wilts as you stir it in. A trick I learned when making quesadillas, whether you make it on the stove, in the oven, or in a quesadilla maker: instead of stuffing two tortillas, use one tortilla and fold it in half! Though I made it both ways, not only do the ingredients not fall out as easily with the fold-over method, but also you can make two at once. 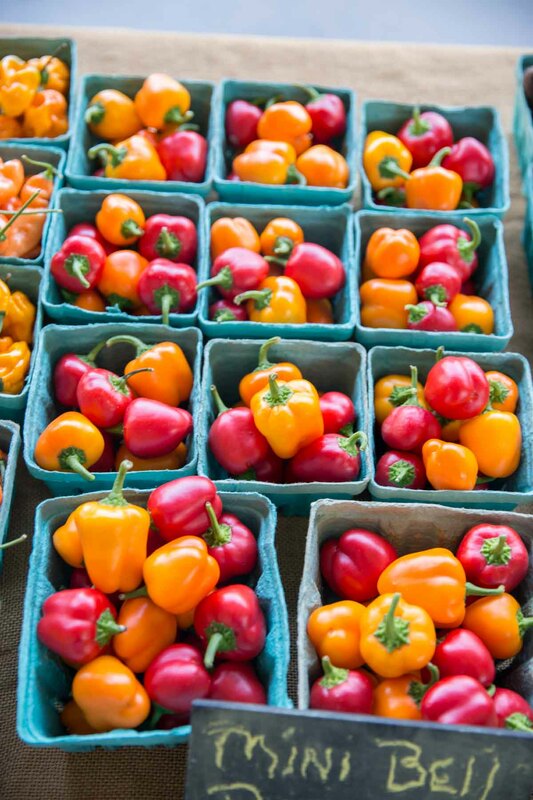 If you happen to have a farmers market that also sells fresh salsa, guacamole, or cheeses – even better! Freshly grated cheeses (cheddar or mozzarella) melt best, so buying block cheese works well. Fresh herbs bring these quesadillas to the next level. 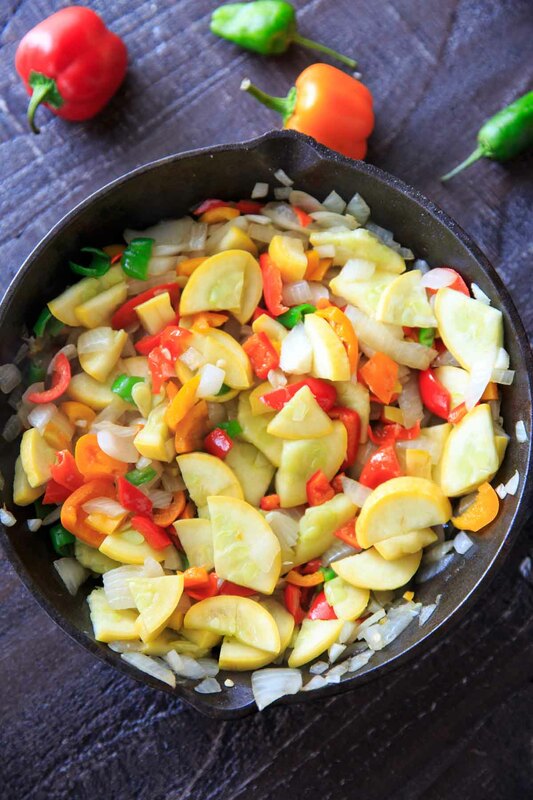 Some suggestions for what go well with squash and peppers are basil, dill, parsley, chives, or thyme. 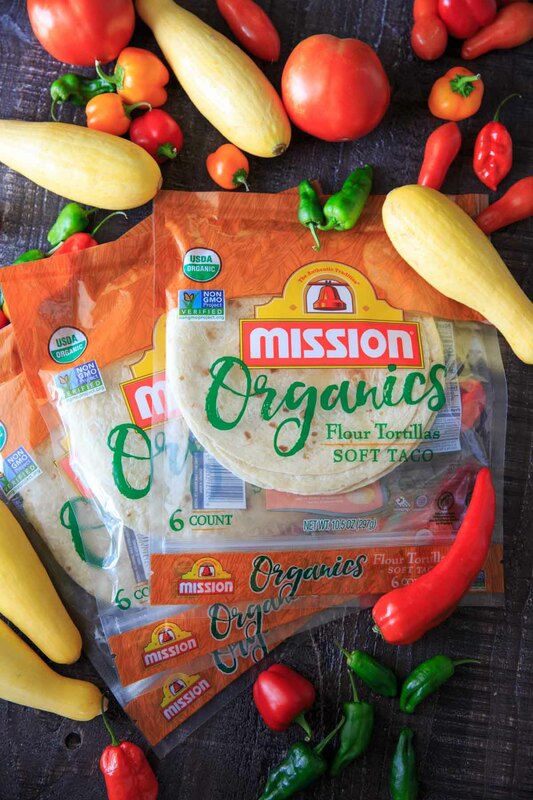 Good news – Mission Organics tortillas are available nationwide! In addition to flour tortillas, they also carry whole wheat and corn varieties. 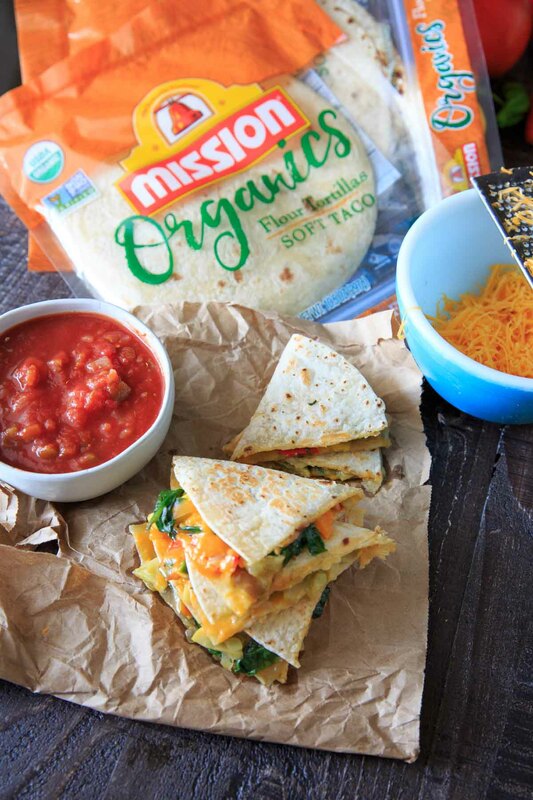 Find a store near you that carries Mission Organics and head to the tortilla aisle. Farmers Market Garden Vegetable Quesadillas. 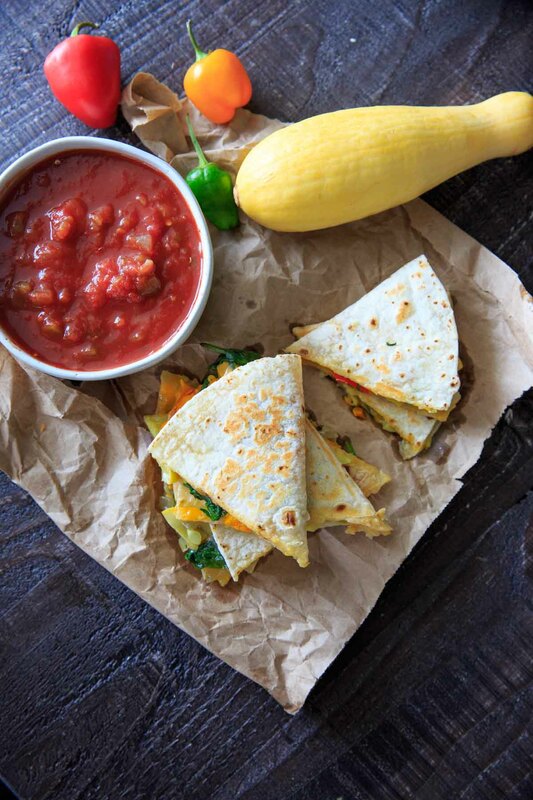 With squash, peppers, freshly grated cheese and Mission Organics® Flour Tortillas, these are easy to make and customizable with your choice of fresh organic produce available at your local market. In a medium cast-iron or other heavy duty skillet, heat oil over medium-high heat. Add garlic and onion and cook for 1-2 minutes until onion is translucent. Add in the chopped veggies: squash, bell pepper, and other peppers. Cook for 4-5 minutes until slightly tender but still crisp. Remove from heat and stir in baby spinach until wilted. Add in fresh herbs now if using. Using the same skillet (or a quesadilla maker), place one tortilla over medium heat. On one half of the tortilla add 1/4 cup of shredded cheese. Cover the cheese with 1/2 cup of the cooked veggies, and top with another 1/4 cup of cheese. Fold over tortilla and cook, flipping as necessary, until cheese is melted and tortilla is crispy. Serve warm with salsa or guacamole. You can use 8-10 mini bell peppers in place of a large bell pepper (roughly 1 cup). In addition to the bell peppers, I used about a 1/4 cup (chopped) of a mix of Padron peppers, Zavory Peppers, and Aji Dulce Peppers. 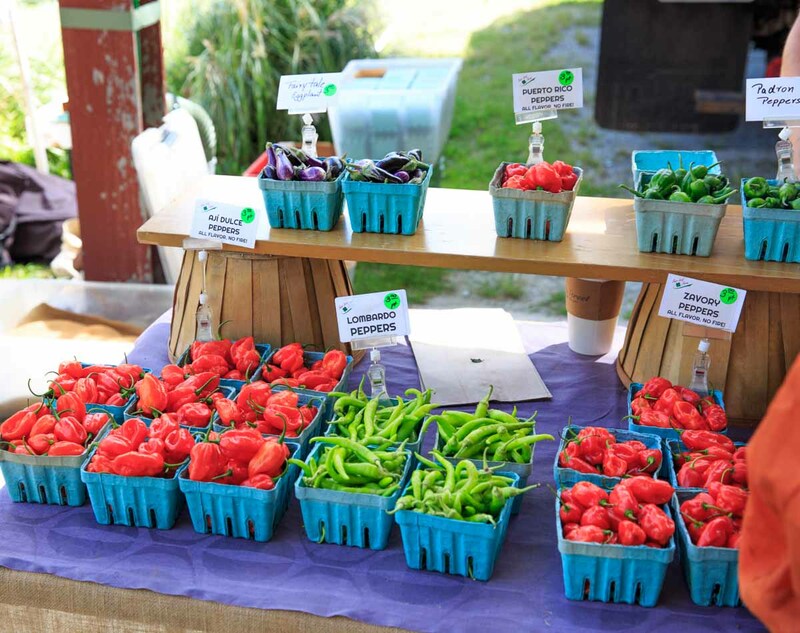 Use some jalapeno or other spicy pepper if you like heat, or what is available at your farmers market! 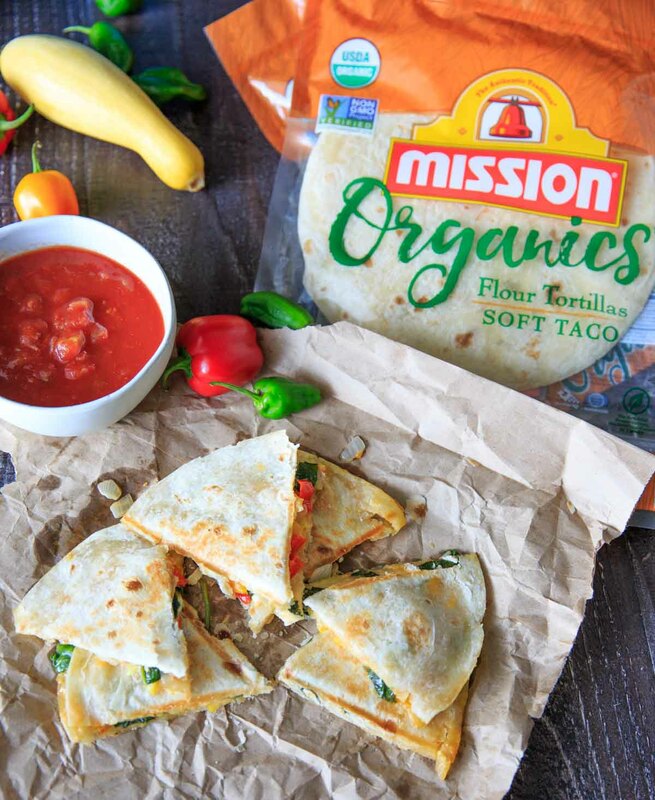 Mission brand is great and the make the only gluten-free tortilla my GF son likes! 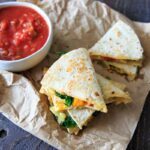 These look delicious — quesadillas are the best go-to breakfast, lunch or dinner, and I’d love this recipe for any of them. 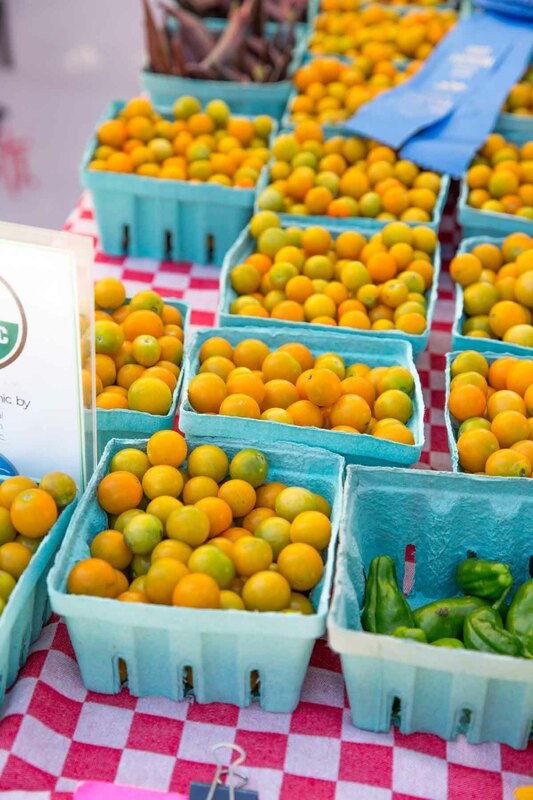 Gorgeous photos from the farmers’ market! I shop at our local farmers’ market twice a week and love the relationships which I have formed with the people I meet there. The produce is also so much fresher and better tasting. 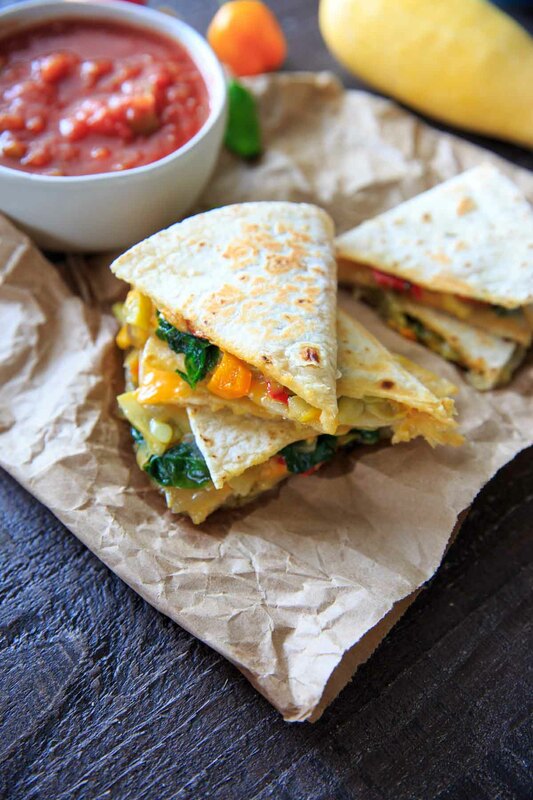 I love making quesadillas for those “lazy” nights, and yours look deliciously healthy! Thanks so much Thanh! Great point about the relationships formed with people at the farmers market- nothing like buying local! What a great use of those farmer’s market veggies! Gorgeous and wholesome! Farmers markets are amazing, so much fresh produce. So much to chose from, so many tasty ingredients. 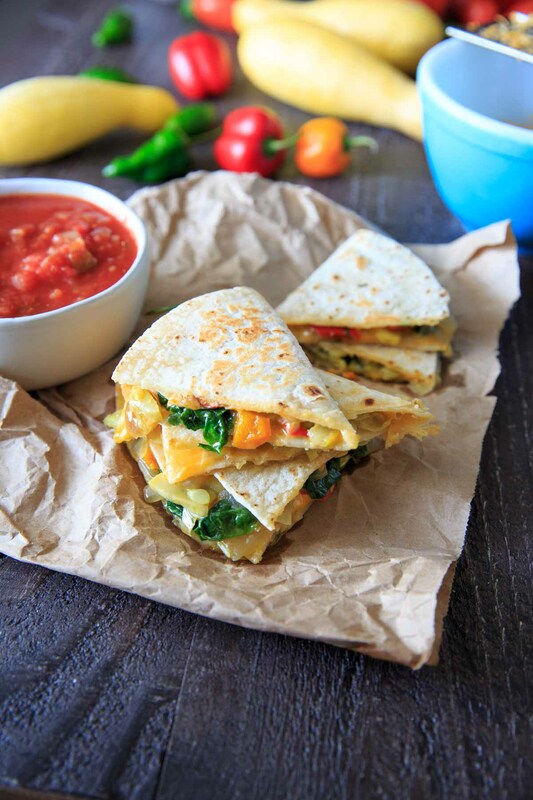 What better way to enjoy them than making something super tasty like these vegetable quesadillas. Gosh, this looks incredible. We also get to enjoy a warm fall and long growing season. It’s about 90 here today and fall is only a couple days away!